It is possible to learn quite a bit by looking at the annual supply and demand of teachers and school administrators across the state of Alaska. Several studies in recent years have added to the information that interested parties can explore regarding current trends in educational employment in our state. Highlights, and full text documents can be accessed from this web page. Although ATP has not Supply & Demand Reports for the last several years, trends have not changed very much in the interim. The top of half of this page will touch on the most recent data ATP commissioned from ISER, which was from the 2013-2014 school year hiring cycle, and the bottom half will address as a reference year the 2005-2006 hiring data. The Alaska Department of Administration did release a report by the same ISER researcher ATP used in the fall of 2015, Dr. Diane Hirshberg, titled a "Teacher Salary & Tenure Study". Although this study was primarily looking at the overall relationships between teacher salary and teacher turnover, it did not note any significant changes from prior studies. Hirshberg does state what we have know from prior studies in slightly different terms: teacher turnover is higher in Bush Alaska than in the road system and ferry system communities. As with the other analyses, larger communities, those with a milder climate and lower percentages of minority students, and more accessible communities had significantly lower turnover. In particular, road access, ferry access, commercial jet air service, proximity to Anchorage or Fairbanks for road-accessible communities, and lower air fares from the regional hub to Anchorage or Fairbanks all reduced turnover. We are frequently asked about the chances of being hired are for a school district, job category or school district. Well, this is our best information about the supply and demand of jobs by region and school district. Trends can tell educators where jobs are likely to be found, and give some guidance as to patterns in high needs, and low needs certification areas. We only have overall numbers from this report, not specific data by certification area. Warning: Don't read TOO much into trend data. Statistics are useful, but only one piece of the puzzle! Teacher supply and demand describes the ebb and flow of certified educators - teachers and administrators really – into and out of school districts in the state. Why should you care? The supply and demand in any profession impacts the amount and characteristic of openings for new entrants. Teacher turnover in Alaska has declined slightly in the last few years, but not significantly. From 2008 to 2012, districts hired an average of 985 teachers each year, about 626 (64%) of whom were from outside Alaska. 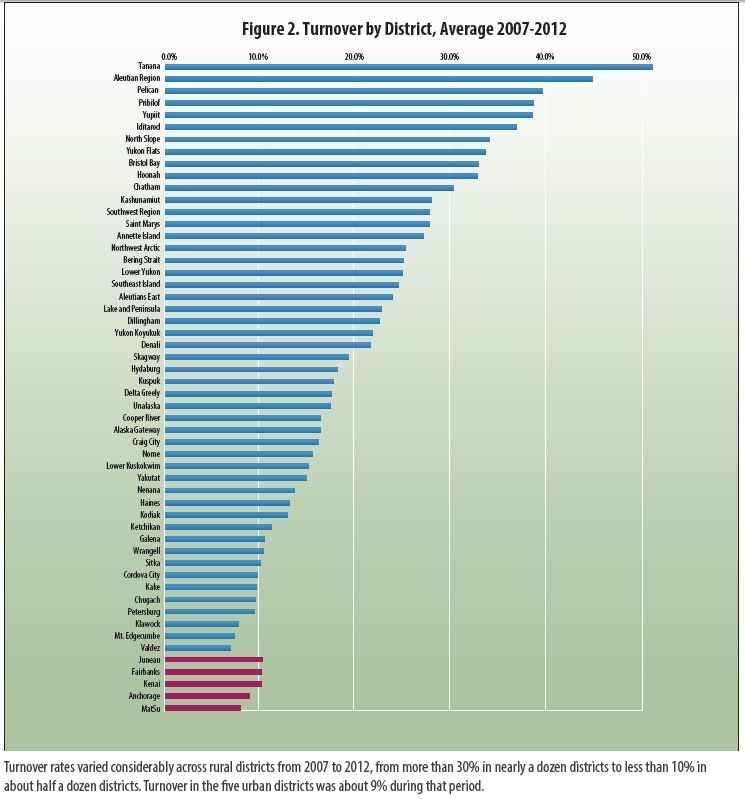 On average from 2008-2012, about 64% of teachers hired by districts statewide were from outside Alaska. Urban districts have turnover rates that are generally lower and more similar, from about 8% to just over 10%. Teachers prepared in Alaska are far more likely to work in urban (Big Five) districts than in rural and remote districts. For teachers in Alaska's most rural and remote schools, turnover rates are statistically about the same regardless of experience levels. Among teachers with less than 10 years of experience, those who prepared to be teachers in Alaska have much lower turnover rates than those from Outside, except in rural and remote schools. Among teachers with more than 10 years of experience, turnover rates for the two groups are about the same. Almost 90% of teachers in Alaska are White. Alaska Natives and American Indians continue to make up only about 5% of the teacher workforce. What Causes Teacher Turnover Differences? Teacher turnover is the percentage of teachers in a given year who do not return to teach the following year in their same district. It's important to also look at how many teachers districts have to hire - i.e., how many of a given year’s teachers were not in the district the previous year. 1134 teachers are either new to Alaska teaching, or moving each year! We took data from the ISER 2005 Supply & Demand Report, and calculated the average number of teachers hired by each district in a typical year. ISER used data gathered over five schools between 1998 and 2003. Alaska Average 14% 8,076 1,131 Note: Latest data is from 4 school years ago. Alaska Teacher Placement (ATP) contracted in past years with the Institute of Social and Economic Research (ISER) between 2005 and 2007 to identify and analyze trends in K-12 educator supply and demand in the State of Alaska, including teacher turnover rates. This report is an analysis of Alaskan teacher supply and turnover data from 1999-2004, and projects supply and demand data for the next five years. Is There a Teacher Shortage? Concern has been expressed in recent years about a potential shortage of qualified teachers for the nation’s schools. A number of factors are seen as contributing to shortfalls: Student enrollment is growing, the teaching corps is aging, and many teachers are nearing retirement age. Finding enough qualified teachers has been a problem for many schools and districts around the country, especially in Alaska. Often this difficulty has been seen as evidence of a national shortfall in qualified educators. However, the United States does not have an overall shortage of teachers. Indeed, nationally, more teachers are trained than are needed on an annual basis. Nonetheless, there is a lopsided distribution of educators, both in terms of the geographic location of available teachers and in the numbers of teachers trained in particular fields. For example, there are shortages of teachers in specific subject areas, including special education, mathematics, and science (Darling-Hammond & Sykes, 2003). Still, retaining current teachers, rather than training new ones, is the larger problem nationally. Ingersoll (2003a, 2003b) found that increasing student enrollment and teacher retirements due to an aging workforce are not the primary causes of teacher shortages. Rather, the major factor driving teacher shortages is teacher turnover, both from educators migrating to new positions and from those leaving the teaching profession altogether, prior to retirement age. Studies have found that between 40 and 50 percent of new teachers leave the profession within the first five years of their teaching career (Ingersoll and Kralik, 2004). The primary reasons for educator dissatisfaction(in national studies) were poor salaries, poor administrative support, and student discipline problems. Many schools in Alaska are in remote locations accessible only by plane or boat, so access can be both expensive and difficult. Housing availability and housing costs are often problematic (NANA Pacific, 2004), and in some rural Alaskan communities, teacher housing even lacks water and sewer hookups. Health care, shopping options, entertainment, and other "city" amenities can be quite limited. Teachers in rural schools are often required to teach multiple subjects across several grade levels. Cultural differences can create difficulties, especially for those who come to Alaska from the "lower 48" states. Alaska is home to many Alaska Native cultures; each having distinct languages, belief systems, traditions, and cultural practices, and it can be difficult for non-Native educators to learn how to work effectively within Native communities. No comprehensive study of teachers who leave their jobs has been conducted in Alaska. However, McDiarmid, et. al., (2002) surveyed a sample of teachers in Alaska (n=135) who left their jobs at the end of the 2000-2001 school year, to try to understand why teachers either changed districts or left the career of teaching entirely. When asked why they changed districts, the vast majority of teachers cited personal or family reasons (80%). Many also indicated they wanted to reside elsewhere (63%), were dissatisfied with district administrative support (61%), community support of the school (51%) or school board support (45%). Affordable housing and higher quality housing were also significant concerns (46% and 38%). Salary was only a concern for 22 percent overall, although teachers moving between urban districts were much more likely to change positions due to salary (50%) than rural educators (14%). Better medical care was of concern to rural educators (30%) and not at all (0%) for urban teachers changing districts. When asked to explain why they left teaching completely, subjects cited family or personal reasons (59%), the choice to pursue another career (50%), dissatisfaction with job description or responsibilities (45%), and dissatisfaction with community support of the school (37%). Better salary or benefits were only cited by 21 percent of those leaving the teaching profession. Health issues were another significant reason for teachers’ departure (18%).